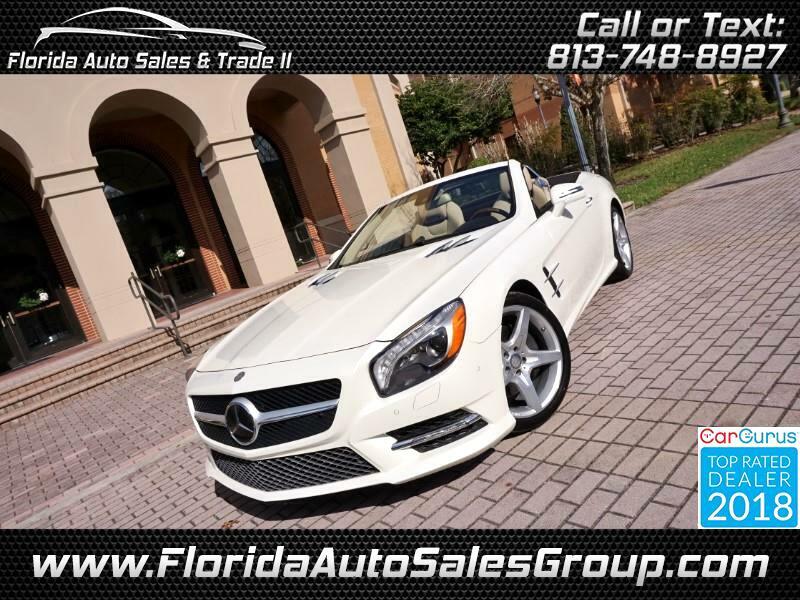 This fully loaded 2016 Mercedes SL400 has over $11,000 in factory upgrades! It is a 1 Owner, Florida, AutoCheck Certified vehicle with NO accidents, NO frame damage, NO flood damage, and NO odometer problems. We purchased this vehicle from Mercedes Benz Financial here in Florida. This SL400 was very well taken care of! It is in excellent condition all around! It is still under Mercedes’ Bumper to Bumper Factory Warranty, Drivetrain Warranty, Roadside Assistance, etc! Some of the many upgrades include the Driver’s Assistance Package, Premium Package, Hands Free Liftgate, Sport Package, AMG Wheels, Navigation System, Backup Camera, Blind Spot Monitor, Lane Departure Warning, Attention Assist, Distronic Plus with Pre Safe Brake, Active MultiContour Seats, AirScarf, Parktronic with Active Parking Assist, Sport Steering Wheel with Shift Paddles, Heated and Cooled Seats, Leather Seats, Wood and Leather Steering Wheel, Harman / Kardon Sound System, Bluetooth Audio, Bluetooth Phone, AUX, USB, XM, Keyless Start, Keyless Entry, Tire Pressure Monitoring System, Power Seats, Power Windows, Power Door Locks, Power Mirrors and so much more! Inside of the Mercedes is in immaculate condition. It is a NON-SMOKER vehicle. Outside the vehicle is also in immaculate condition. We specialize in both domestic and international shipping. You are also welcome to pick up the vehicle and drive it home. If so, we will pick you up at the airport. Message: Thought you might be interested in this 2016 Mercedes-Benz SL-Class.